Georges Frederic Roskopf (15.03.1815 – 14.04.1889) born in Alsace, then Germany now belonging to France, has worked for many years as watchmaker, also apprenticed in La Chaux de Fonds (Switzerland) before opening his second business in 1855 together with his son, Fritz Edouard and Henry Gindraux as ‘Roskopf, Gindraux & Co’. Roskopf was an idealist who dreamed of making good quality, low cost watches for the working man. After two years, his son left him to open his own watch business in Geneva while Gindraux left him to become director of the watch making school of Neuchatel. In 1860 G.F. Roskopf began to design a watch that could be sold for 20 Swiss francs (then a week’s pay of an unskilled laborer) and still be of excellent quality, simple and solid. He called this watch “montre proletaire” (laborer’s watch). At first, Roskopf met indifference and hostility among the watchmakers of the area, who were still working as a home industry and who did not wish to make a watch, suitable for mass production. It is said, that in 1866 Roskopf ordered two boxes of ebauches (= raw watch movements) from Emile Roulet and asked Gustave Rosselet to make escapements. Both refused to take his orders. He finally succeeded in producing his watch in 1867, using ebauches and cases from the ‘Malleray Watch Co’., and parts from many other makers, and having them assembled in Damprichard, France, by M. Chatelain. The original order to Malleray was 2,000 watches. By the end of 1867 he was in business and by 1870 he had ordered 20,000 ebauches. Through the influence of the famous house of Breguet in Paris, Roskopf was able to present his watch at the Universal Exhibition in Paris in 1867. This was a brave decision: 152 Swiss competitors were present with their “masterpiece”. The jury gave Roskopf a bronce medal; a surprise to anyone, included Roskopf, but it is to be said that all together 4 golden, 6 silver and 15 bronce medals were distributed. From then on, even Breguet began to send him orders. Some movements were supplied to ‘Borel & Courvoisier’. And more orders poured in. 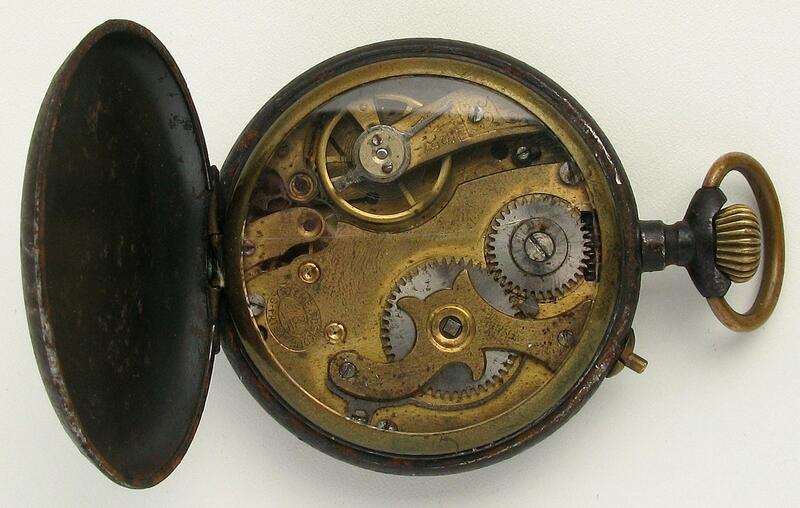 In 1870 G.F. Roskopf introduced a second design with a setting mechanism. This watch cost 25 Swiss francs. In it he reduced the number of parts further, simplified the escapement fitting, and introduced an improved winding system. This watch was crown-wound (still one directional only) and button-set. Inside of his oversize barrel he arranged to use Adrien Philippe’s (Patek, Philippe) free mainspring patent, for which he had to pay a royalty on each watch. . The purpose of this was an unbreakable mainspring. Although Roskopf’s watch was actually intended for the poor man, they were not his first customers, but aristocrats and army officers were. In February 1867 Roskopf hired a young man, Charles Léon Schmid, to sell the monthly output of 500-600 watches. Charles Léon Schmid had the brilliant idea to present the watch to different European armies and railroad companies. Soon, demand could not be met. A patent office was founded in Switzerland not before 1888. Hence Roskopf was not able to patent his inventions in Switzerland. At least he patented his inventions in France, Belgium and the USA, then the world’s major watch centers. That’s why Roskopfs watches were copied in Switzerland frequently. #18632, …3. Jan 1899: Fritz Edouard Roskopf, Roskopfs son, for an improved setting of the hands.